When she’s out in public, people regularly stop and wave at 18-month-old Euphoria. Some mouth “hello”; some just look happy to see her. It’s hard to figure out if these are the reactions of people spotting an adorable toddler with big, brown eyes and plump, dimpled cheeks, or if they are recognizing a minor Instagram model with 100,000 followers. “I always thought I’d never put my baby on any kind of social media, and I never expected for it to boom.” Euphoria’s mother, 27-year-old Cheryl-Anne Stampp, told BuzzFeed News, sitting in a quiet, half-empty Latin American chain restaurant in her hometown in England. Stampp is Jamaican, Nevisian, and Anguillan, and her partner — who did not want to be named — is Albanian. The couple and their young daughter have found themselves at the epicenter of a new, incredibly popular, and — some would say — uncomfortable Instagram community that focuses on aspirational photos of mixed-race children. Stampp discovered mixed-race baby Instagram pages when she was pregnant. She would look through them, trying to imagine what her future baby might look like. 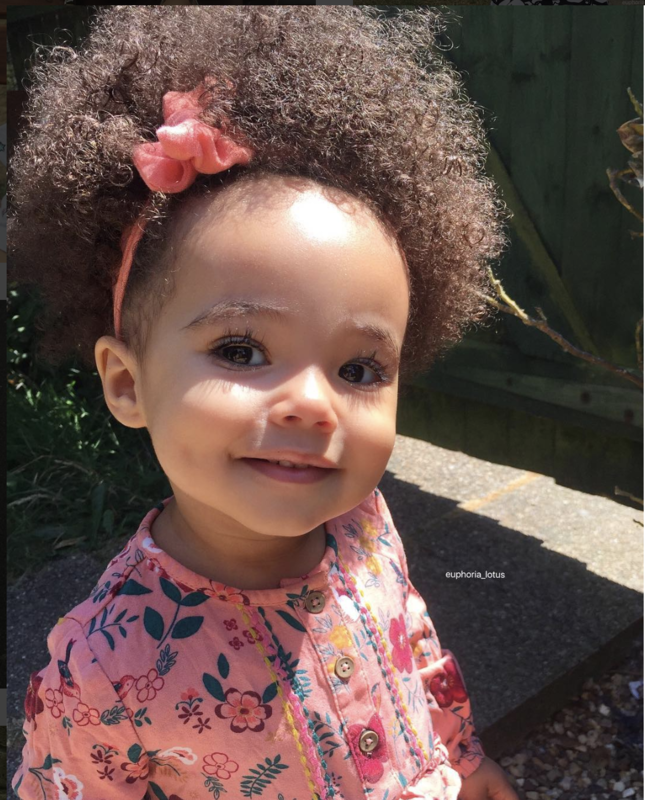 These fan pages have exploded in popularity and have inspired an entire network of mixed-race toddler influencers like Euphoria. The names of the bigger pages usually include some variation of “mixed kids,” “mixed babies,” or “swirl.” Each photo typically lists the baby’s name, their ethnic mix, and a tag for their personal page if they have one. And then, below the photo, hundreds of comments usually praise the child’s looks and ethnic makeup. Those running these pages can make thousands of dollars a month from adverts and parents paying for their children to be featured. 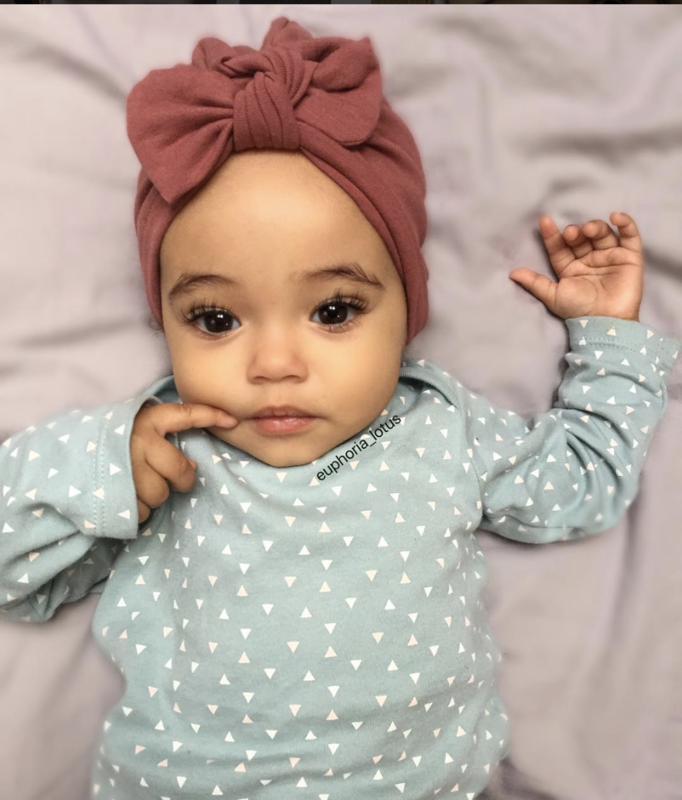 While there are only a handful of pages specializing in promoting multiracial children, their popularity means they are some of the biggest baby photo pages on Instagram. The main ones have hundreds of thousands of followers and their ability to catapult the follower count of a child’s personal Instagram page means the owners can charge parents and other family members for even a brief appearance on an Instagram story or, more permanently, in a post on their page. Stampp says she really believes that people can come to embody their names. So when she was pregnant, she and her partner picked “Euphoria” with the hope that she would live up to its meaning. For pretty much her whole life, Stampp has lived in one of the “new towns” built in the 1960s to ease London’s housing problem. The towns were built on a grid, created with the promise of providing green spaces, new homes, and easy access to big cities. Stampp requested that her exact location be withheld for privacy and safety reasons. Today, Stampp’s hometown seems to blur into all of middle England: the same chain restaurants as everywhere else, the same green spaces strategically placed between busy roads, the same mostly white demographic. On the day Euphoria was born, one of the midwives told Stampp that her daughter had “all of the charming features.” In the months that followed, nurses and family members remarked on Euphoria’s beauty and said she should get into modeling. Around the same time, Stampp saw an interview with the mother of Harlen Bodhi White, a 2-year-old with over 200,000 Instagram followers. Chelsea White spoke about all the perks the family had gotten through the page — trips abroad, gifts, clothes — and Stampp saw an opportunity. She was already posting photos of her daughter to her own Instagram account, so thought she’d try one just for Euphoria. If it worked, great; if not, it’d be a nice memento of her childhood, like a photo album. “As a parent, you want your child to have every opportunity possible. I’m not rich, I can’t send her off to Harvard, but maybe she’ll get there herself. I can’t give her what some parents can give her, so I’m doing what I can do and giving her every opportunity,” she said. For Stampp, some people are born into wealth, some are born with connections; Euphoria, she said, was born beautiful. Stampp gave up her job just after Euphoria was born, and, as she can’t drive, she spends most of her time at home or out nearby with her daughter. This gave her time to devote to the account. She started it in mid-2017 and began to learn how best to utilize Instagram. “I was quite regimented: OK, if I post on a Tuesday at 6 p.m, and it gets more likes than a Wednesday post at 4 p.m. ...” she said. 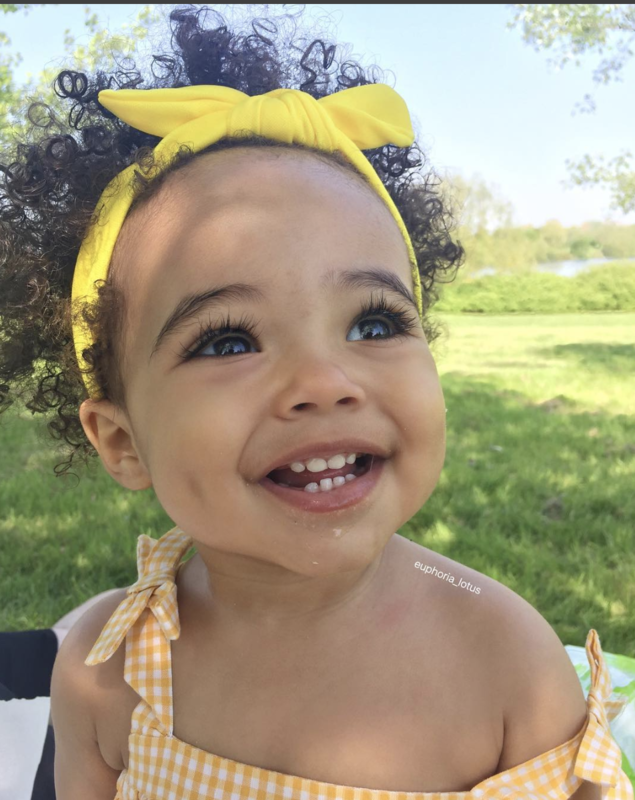 She started learning to use hashtags like #mixed, #MixedKidzIG, and #CurlyBaby, and tagging the location of the photos as London. She said it’s a more popular tag than the one for her hometown and protects Euphoria’s privacy. She essentially became her baby’s social media manager. She and her partner would take Euphoria to pretty spots near their home for photos, and she learned how to get Euphoria to smile on camera. She says her family and friends are mostly supportive, although her dad doesn’t really understand social media. To grow the page more, she began reaching out to the users who ran the pages she would look at when she was pregnant, asking whether they’d feature Euphoria, and almost immediately they did. But once Euphoria’s own page surpassed 10,000 followers, Stampp slowed down the rate at which she was posting photos and focused more on the business side — monitoring the likes-to-followers ratio, making sure she didn’t oversaturate the page and mess up the engagement rate in case businesses approached her. It took her about a year to crack 100,000 followers. Euphoria has been sent clothes, she’s been offered some free baby items in return for posts mentioning a brand — she’s even been approached by a couple of model scouts about potential work. But the scouts were based in the US, thousands of miles away. Although, if brands aren’t willing to pay actual money to appear on Euphoria’s page or use her image, then Stampp said she can’t see how it’s going to help her daughter in 15 or 20 years’ time. The account hasn’t just bought a taste of fame to Stampp and Euphoria; it’s become a crash course in the nuances of internet culture in 2018. “I didn’t know about the mixed-race obsession before I had Euphoria. But for me as a mum, I just want her to have every opportunity, and so, if that means playing the game, then sure,” said Stampp. As Euphoria’s name grew on Instagram, Stampp was embraced by others in the world of Instagram babies. The users she direct-messaged for promotion became online friends, and strangers began messaging her to compliment Euphoria. Other mothers appeared in the comments of her posts, and she soon found herself part of a whole community. Stampp said most of those who interact with her are other black mothers of black or mixed-race kids and run their own pages or pages that collate photos. She said she has friends in real life who are supportive of her work. For many of the other mothers of mixed-race babies on Instagram, that support comes from one another. They see themselves as part of a network of parents in mixed-race families, many of whom are encountering mixed-race identity in their lives for the first time. “My nephew is mixed with Moroccan and I had never seen anything like that,” said Elise Watts, a 21-year-old originally from Canada, now living in Morocco. Seeing her nephew inspired her to set up a page to celebrate children like him, so in February 2017 she started mixedkiids, a page devoted to celebrating mixed-race babies. Since then, it has grown to 30,000 followers and has become a significant page in the community. Before long, Watts was able to begin charging $9 per feature: “As I amassed followers, wait times were getting impossible and people offered to pay; now it’s the new norm.” She estimates that when the page started, it was making around $400 a month; now it’s closer to that a week. Once a week, she said, she tries to highlight a nonmixed kid, to celebrate all beauty. She now has her own mixed-race child, who has an Instagram page with close to 2,000 followers. For every tweet about how mixed-race kids are the future or key to ending racism, there’s a quote tweet asking people to stop using children as a eugenics experiment. But any success found within the mixed-race baby Instagram community comes with the complication of the racial politics that surround mixed-race identity in general. People and pages are often called out for fetishizing the mixing of races or only valuing ethnic minorities when they are combined with whiteness. The conversation is heated: For every tweet about how mixed-race kids are the future or key to ending racism, there’s a quote tweet asking people to stop using children as a eugenics experiment. Rosalind Edwards, professor of sociology at the University of Southampton, said that the popularity of images of mixed-race people — and not only online — could be interpreted as offering some sort of hope for a better future. “They represent an aspiration that one day we could all get on, that racism could be solved and that we can live together peacefully,” she said. But Remi Joseph-Salisbury, a presidential fellow in ethnicity and inequalities at the University of Manchester, acknowledged that the greater focus on mixed-race people can more negatively be seen as linked to colonialism, in which a white, Western narrative values the proximity to whiteness that a lot of mixed-race people have. “Racist subordination means that Black and Brown bodies have not only been a source of fear and disgust but also of fascination and admiration. It is possible that some mixed-race people (particularly those with white heritage) occupy a particular position within this dichotomy: different, but not too different; exotic, but not too exotic; exciting, but not too exciting,” said Joseph-Salisbury in an email to BuzzFeed News. A scroll through one of the popular pages shows that the majority of kids featured appear to have some Caucasian ancestry. Edwards refers to this as a hierarchy of mixedness, where children of white descent are valued more highly. “Social media is a thing, so let’s use it to our advantage,” Stampp said. But playing the game comes with downsides. The faceless nature of social media can lead to people making comments they’d never make in person. When she was first starting the account, people would steal photos of Euphoria and post them on pages without Stampp’s permission. She learned to watermark images to stop this. So the people stealing them would cut out the watermarks, leading Stampp to place them on her daughter’s body in photos, like tattoos. What really upset Stampp was when people would take photos and edit them, making Euphoria’s eyes or skin lighter. An edited photo of Euphoria. Stampp also got comments accusing her of exploiting Euphoria by putting makeup on her, of sexualizing her in photos, and of using her “like an accessory.” Recently, she received a hate message regarding her interracial relationship. When her partner messaged the sender, they wrote back referring to him as “the sperm donor.” So in July this year, Stampp tried to address this and the vilification of mothers in general. Some followers teased her for her long caption and she felt hurt that they weren’t taking the subject seriously. Akeisha Land, 37, said she has also seen the way people online can turn on mothers. She lives in Kansas City with her two kids and her husband. She originally set up an account for herself, but once she started posting photos of her second child, Greyson, she noticed that people and companies seemed interested in her, so she changed the name on the account. She still occasionally posts pictures of the family, but the draw is Greyson, who now has 77,000 followers. Earlier this year, she screenshotted the abuse she got for “her parenting choices” and shared it to her account; the pictures showed commenters saying that Greyson was going to hate her curly hair when she was older, and her nose would grow bigger and be “really too wide.” Land was called a “perv” and was accused of putting makeup on her child. She told BuzzFeed News that she tries to ignore the trolls and stands by the caption of her post: “don’t be mean.” A spokesperson for Instagram told BuzzFeed News that they take a zero tolerance policy toward bullying, and if someone feels comments made to them were inappropriate or believed that their photos had been stolen, then they can report this in-app. The online abuse, the overwhelming amount of time spent on social media, and the everyday stress of being a mother has meant that Stampp has felt burned out and unable to run the account at times. Earlier this summer, she took a six-week break from posting because Euphoria got a scratch on her face, which she worried about showing on the account, and Stampp was going through a period of depression. When she started posting again, she struggled to get back into the swing of things and felt worse as she watched her follower count drop. “It’s all exhausting and you just want more followers. It’s like a job,” she said. But, for Stampp and the other moms, it’s all worth it. Stampp said it’s all so that Euphoria might have better opportunities in life. She told BuzzFeed News the pair planned on meeting with a professional photographer soon and hoped other opportunities would arise from the page. Stampp said she’s noticed that Euphoria has been making little chirping noises lately. She hopes it’s a sign that she might like singing one day, and that eventually the account might be noticed by an agent in the UK, so Euphoria can get opportunities to model, or travel the world, or just experience something outside their town. Right now, though, Stampp just wishes people would be kinder and more open to mothers like her, who are just trying.